You may have also heard me talk about how much I believe in "everything in moderation". We don't follow any specific kind of "diet", other than eating just real food. (I don't consider that a diet though, I consider that to just be normal.) Because we don't have any food allergies or specific food intolerances, there isn't anything that we can't eat. We are omnivores, who eat all real foods, in moderation. But moderation to me means that we don't eat all the things all the time, and we shouldn't eat all the kinds of things at every meal. So even though I don't have to for a dietary reason, you will still find me fixing meals for my family that are gluten free, grain free, nut free, dairy free, meat free, etc. I believe in doing this to provide variety for my kids, and I think it's good for them to learn that they can have a great meal even if it doesn't include bread, or dairy, or meat, etc. A full year of school lunch ideas! This is the one place to look for all of the lunches I have packed since the beginning of the current school year - a full year of school lunches, plus lots of adult lunches mixed in as well. You'll see all my lunch ideas here, including breakfasts for lunch, nut free lunches, gluten free lunches, non-sandwich lunces. Wednesday is our breakfast for lunch day, and muffins make such a perfect and easy breakfast for lunch. Even though this recipe has chocolate chips, it's still healthy enough that I think it's a great lunch choice. With whole wheat flour, plenty of fruit, and no refined sugar, it's a great balance of sweet enough for them and healthy enough for me. I love having this kind of thing made for lunch. Paired with a little fruit and a little protein, it's an easy lunch. I mentioned in my last lunch roundup that I was feeling like I was in a bit of a rut, so I tried a few things this week to mix it up a bit. I also realized that in my rut I had slipped into a habit of a lot of grain and carbs, and not as much fresh fruit and veggies and protein. So I tried to adjust that balance a bit. I did several lunches that were totally grain free. Not because I have to for any dietary restriction, but because I believe in everything in moderation, and having wheat and grains at every single meal is not moderation, so we needed to get that reigned in. I also found that giving myself a bit of a 'box' to work in helps force me to be a little more creative. I had to think a little harder about how to round out the meal without the grains, and I'm really happy with the results I came up with. I feel like it helped break me out of my lunch rut. So my suggestion to you: if you're feeling like your're in a lunch rut, give yourself a challenge. Challenge yourself to do a week (or even just a few days) of grain free lunches, or dairy free lunches, or or meat free lunches - or whatever other idea you can come up with! It will help force you to think outside your usual box a little. I also want to remind you to keep offering a variety of fruits and veggies - even if they don't eat it!! Studies are showing that even just exposure to healthy foods in childhood leads to better adult eating habits - even if they don't eat the food as kids. Normalize real foods for them! Seeing a variety of healthy food at every meal teaches them that these foods are normal and expected. So even if they don't eat it, they are learning and benefiting from it. Encourage them to try it, but don't pressure. They resist when you pressure. I remind my first graders that I want them to try everything that is in their lunch, but I don't tell them they have to eat it all. I don't always expect them to eat all the veggies, but that's not going to stop me from including it in the lunch. Because one day they will try it. And one day they might like it. Also if you're not already following me on Facebook or Instagram - you should! I'm trying to share what the lunch boxes look like at the end of the day, so you can get a realistic picture of what they are actually eating. Our lunches are packed in Easy Lunchboxes. I love using bamboo skewers to hold things together. And kids love food on sticks. Silicon muffin cups make perfect size dividers in the lunch boxes. These are my favorite. Little picks make lunch more fun! This week I used letters and animals. Small spoons are easy to pack in the lunch container. Hot dogs (Applegate brand, no artificial stuff!) on whole wheat buns, zucchini and carrots, popcorn, grapes. A grain free lunch. Skewers of tomatoes, cheese, and ham for the two that eat it. In between they each have a piece of zucchini, celery, and red pepper (which they did taste!). Fruit on the side: banana, grapes, oranges. Breakfast for lunch: three have homemade whole wheat pancakes, one has potato pancake, filled with cream cheese or butter. Orange and cheese on the side. Two have boiled egg, one has rice chex, two have ham, one has sunbutter. Grain free lunch. Cubes of cheddar and jack cheese, salami, tomatoes, cucumbers, strawberries, blueberries, raisins, apricots, and one has a boiled egg. Grain free lunch. This was an experiment with a sandwich on grain free bread. One has butter and cheese, one has mayo, ham, and cheese. They also have carrots, apples, tomatoes, blueberries. I thought the grain free bread was great, but they didn't love it. You might look at this and think that it looks so fancy that it's something you will never actually do, but I'm telling you it's not. These are very basic ingredients and prepared with very simple tools. All you need is a little heart cookie cutter, some skewers or toothpicks, and some muffin papers or cups. My lunches are all made in these lunch boxes. 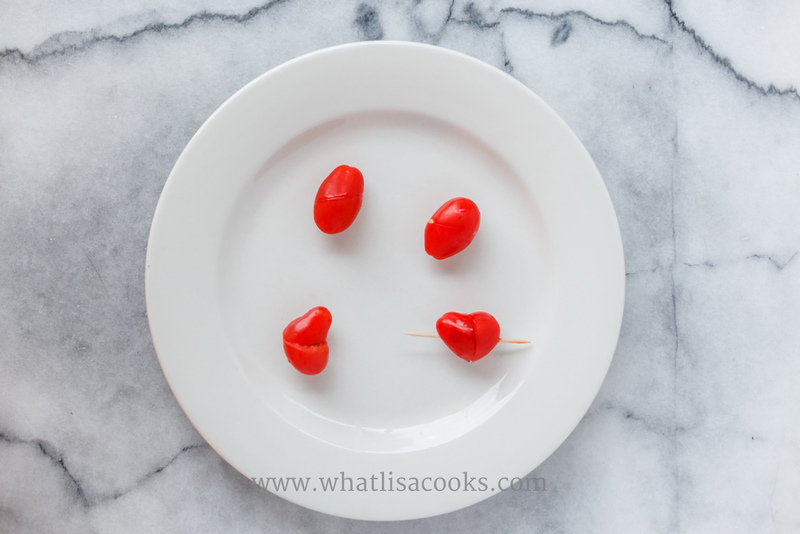 Skewers of grape tomatoes and cheddar cheese. The cheese is just cut with a heart cookie cutter. The tomatoes are sliced in half slightly diagonally and put back together (see below). Paper valentine's muffin cups that I got at the grocery store. Thick sliced salami with hearts cut out - using the same heart cutter as the cheese. A babybel cheese with a heart cut out of the wax, also using the same heart cutter. One slice of carrot, cut with the heart cutter. A variety of fresh berries - they are such pretty colors! A few little yogurt covered star cookies, in a silicon muffin cup - The cups are from Ikea.